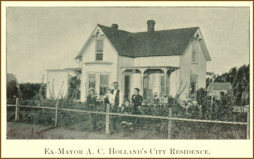 The photograph on this page is a splendid likeness of the residence of ex-Mayor Holland, who owns one of the most beautiful residences in the city of Perry. It is situated in the eastern part of the city upon a half block of ground. a part of which is nicely wooded. The lawn and surroundings are always neat and the place is one of which any person might he proud. Mr. Holland has been honored with the highest office in the gift of the city and his administration is marked for his honesty and integrity. Mr. Holland is a gentleman in whom the taxpayers have implicit faith. He is a farmer and is one of the few who make a success of farming by "proxy." He has a large farm in Logan county and a good valley farm in Noble county. He superintends the work upon both of these places and the yield of his crops this year have been simply phenominal. What has been said of many representative citizens of Perry might be applied to C. T. Talliafero, who has become the acknowledged leader of his race in Noble county and one of the prominent colored men in the Territory. "Tally," as he is familiarly known to his friends, is bright, industrious and has enjoyed a successful business career in his line. From a small fruit stand on the street in the early days of Perry his establishment has grown to the dignity of a grocery, fruit and produce house of no small importance. He is now comfortably loeated on the north side of the square and has a very neat stock, including a great variety of goods to select from. He has enjoyed the benefits of a liberal education, having worked his way through Roger Williams college near Nashville, Tenn. 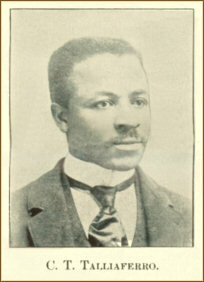 He was born at Brownsville, that state, in 1869, and entered the above college in 1881. He remained in school until 1889. when he came to Helena, Ark.. taught school four years and then made his way to Oklahoma. He is vice-president of the Colored Men's Protective League of Oklahoma, and his oratory is heard in all of the gatherings for the advancement of his race. 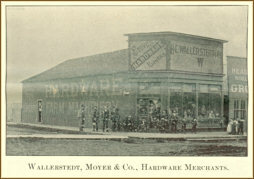 The large iron building of Wallerstedt, Moyer & Co, at the northeast corner of the square carries as complete a line of hardware, farming implement (sic), wagons and buggies as there is to be found in Oklahoma, and the car load after car load which have been sent out from this establishment this year shows that they carry a line of goods and put a price upon them which meet with the farmers' approval. The management have secured the agency for the leading maker of goods in their various lines and when they put an article on sale it is certain that their merits have been tested. Mr. Wallerstedt was, for a number of years, the traveling representative of a large wholesale and manufacturing concern and in that capacity gained a knowledge of goods from the manufacture to the retailer which has been of great advantage to him in purchasing for his trade. From a threshing machine to a pound of nails he knows its composition and cost of manufacture and brings the information into good use in every department of his large business. The purchasing public have learned to look the articles over in this house before purchasing and buyers are always well pleased with their dealings. This is one of the most enterprising firms in Perry and they have assisted in many public improvements for the benefit of the city and county. The business importance of a city is often indicated by its banking facilities and in this particular the people of Perry and Noble county are fortunate in having, a safe, sound and conservative institution in which to transact their financial business. The Exchange Bank of Perry possesses these characteristics and its business and number of friends have grown from the time the hank was established. Mr. F. G. Moore, the president, and H. A. McCandless, cashier, both give their entire time to the conduct of the business and their years of experience is shown in all of its branches. The Exchange Bank conducts a general banking business, loans and receives money on deposits. deals in negotiable paper, buys and sells exchange, etc. The management are always ready to extend every accommodation to their customers consistent with sound banking. They are courteous gentlemen with whom it is a pleasure to transact business. 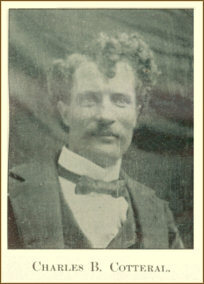 Charles B. Cotteral. who has been in Perry from the first day, in company with his father has opened on the north side of the square a clothing and men's furnishing- goods store and by his enterprise is making it warm for some of his older competitors. Their stock was purchased at a figure where they can sell at what other firms pay for their goods and clear a good profit. A neat clean line of men's furnishings and a splendid assortment of shoes add to the attractiveness of the stock, and bargain hunters rarely pass this place by. The salesmen are courteous, clever people to do business with. It will pay intending purchasers to call and look through their stock. One of the prettiest county homes near Perry is that of H. C. Nicholson, two and a half miles east of the city. Mr. Nicholson located on this place at the opening and he has it splendidly improved as will be seen from the illustration in another column. He is engaged in the merchant tailoring business in Perry and represents one of the leading firms of Chicago and one of Kansas City. He sells neat fitting garments made to order at only a little shade higher than the ready made goods and he has built up a good trade. Satisfaction is guaranteed to all who favor him with their trade, and perfect fits he makes a specialty.